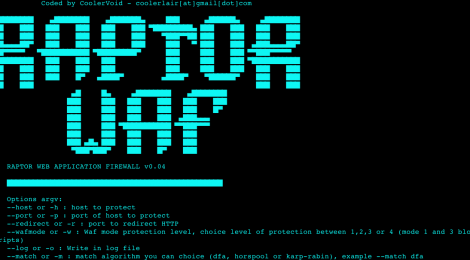 Browse: Home / Raptor Web Applications Firewall v0.4. Raptor is a Open Source Tool, your focus is study of attacks and find intelligent ways to block attacks. + Raptor is very simple, have three layers reverse proxy, blacklist and Match(using deterministic finite automaton). + If someone send a request, Raptor do address analysis…Address blacklisted ? block ! WAF stands for Web Application Firewall. It is widely used nowadays to detect and defend SQL Injections and XSS. • At the future DoS protector, request limit, rule interpreter and Malware detector at uploads. + add simple match list and 3 diferent algorithms to match. • Current version tested only in Linux. ← Backdoorme – a powerful auto backdooring utilities.